The plants that grow in this recycled metal ostrich become its living plumage. Ready to give both hanging baskets and gravity-bound planters a 43 mph* run for their money, these ingenious indoor/outdoor ostrich planters stand—literally, on feet—somewhere in between. 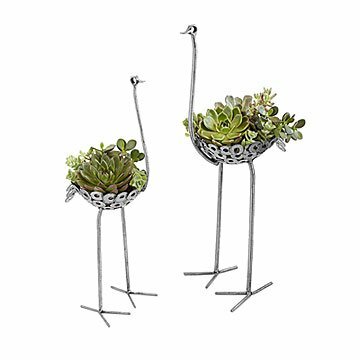 Welded by Kenyan Tom Ateto and his team of artisans using washers, nuts, and other salvaged metal pieces, their "plumage" is created by the arrangement of small plants and/or succulents you fill them with. Imagine both trailing and spiky upright flora and you'll begin to see their potential for magnificence--not to mention personality. Handmade in Nairobi, Kenya. *The speed ostriches can run. My little Ostrich is as cute as the picture! But, even though the size is included in the description, I was surprised by how little the big guy is! We'll figure out how to put some plants in him, but they'll be small! Still very glad I bought him, and even considering a group of 3 for the final configuration! More adorable than the photo! Perfect for transforming our yard into a faux wildlife sanctuary. Beautifully made in Kenya, Once we get his plumage arranged via transplants from our succulent garden, the ostrich will join our giraffe and lion metal sculptures. I wouild buy it again. Each year my family picks a theme and each person makes their version of that them. The items are assigned a number and and a drawing is held so everyone who participated gets to keep a piece of "family art". In 2019 the theme is "yard art". I bought the ostrich planter as inspiration for my project and as a gift for my daughter. These are smaller than I imagined. I didn't go to the trouble of checking the dimensions. They should work well for indoor plants (succulents) but they're a bit flimsy to use outdoors. All in all I'm happy with them. I think they will look great once we get plants in them. They are unique and a nice addition to our indoor "forest"
I gave it as a Xmas gift. Very well made and adorable for the garden. Loved this from the moment I saw it in the catalog! I purchased this for my aunt who loves to spend time in her garden. It is SO CUTE! I can't wait to see what she does with it. I may get one for myself, too. After reading other reviews, I was afraid the planter space would be too small, so I bought the medium size. There's more than enough room. I mostly love the unique design! For the master gardener that has everything, this is a beautiful addition to the backyard. Read the specs on sizes- got the 24 in and it will be great lined up with some larger pots. Not as sturdy as I expected but very cute. Again, not sturdy, which I wanted for the patio outside. I can't trust it won't be knocked over easily.